Applying to universities abroad can be daunting, but if you are looking to further your education in English-speaking countries and English is not your first language, then you will have an extra hoop to jump through. Most institutions will require you to take a standardised test as proof of your proficiency in English. Read on to find out which test is most suitable for you. Which test is more applicable for my application? Firstly, check which test scores are accepted into the institutions that you are applying to. Generally the IELTS scores are more widely accepted in the UK and Australia while the TOEFL scores are more widely accepted in the US. However most institutions accept all 3 test scores. Click here to find out which institutions accept IELTS and the band score required for admission. For TOEFL, click here. For PTE, click here. All three standardised test score results are typically valid for up to 2 years after the test date. For instance, if you took the test on 1 March 2016, the results will be valid until 1 March 2018. Some institutions may accept older test scores but that is up to their discretion. One important factor is the test date and locations. Be sure that the test you wish to take is available in your region. Remember to check if the IELTS, TOEFL or PTE are available in your country/region. There is no limit on the number of attempts for each test. For TOEFL, you cannot take it more than once within a 12-day period. Test formats – Which is better? Now that we have gotten the administrative details out of the way, let’s move on to the test details. Depending on the scoring system and test format, one test may be more suited for you than the rest. Here at Global Study Abroad, we help you make the best decision for yourself. There are two types of IELTS tests – Academic and General Training. The IELTS Academic test is usually taken for admission into university and the IELTS General Training test is usually used for visa applications. The details listed are for the IELTS Academic test. Content – For instance, the listening component for TOEFL is purely academic whereas the IELTS and PTE also test on everyday social context. Do you struggle with academic terms? Some students might also find it nerve-wracking to speak to an examiner while others might find it weird to speak to a computer. This can affect your performance in the speaking test. 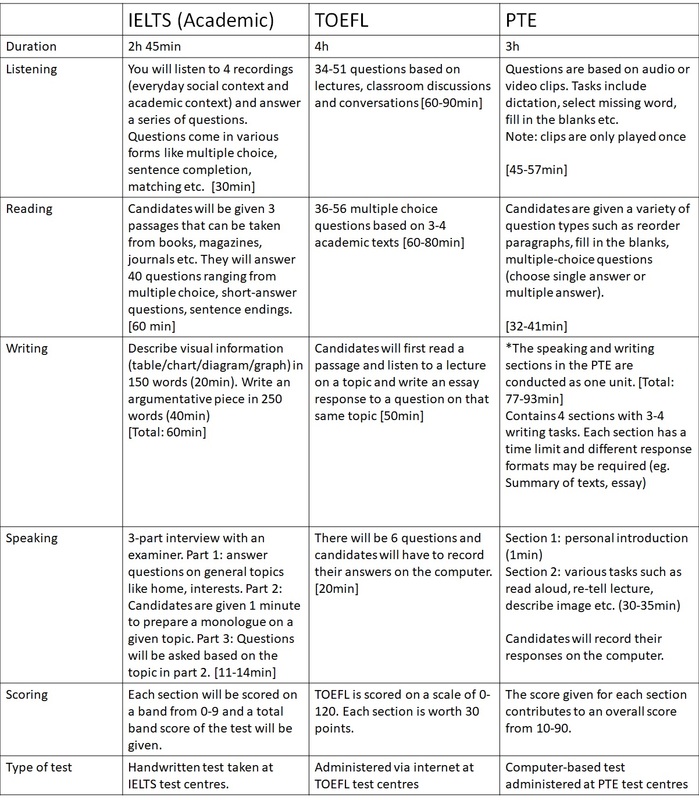 Duration – The duration of each test differs and some students find it hard and tiring to concentrate for long periods of time while others have no difficulty with that. Computer vs Handwritten – You might find it difficult to write quickly and legibly and thus be more confident in typing, or you might be more comfortable with penning down your thoughts. 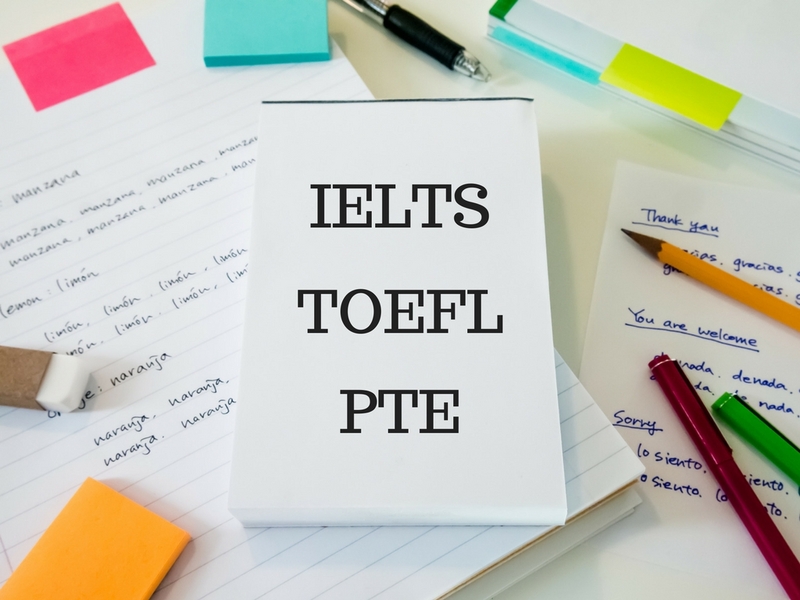 The IELTS is a handwritten test while the PTE and TOEFL are done on computers. Cost – The costs for each test vary and you might want to pick a test depending on your budget. For information on fees for IELTS, click here. For TOEFL, click here and for PTE click here. Do note that the fees differ from country to country. For more information on entry requirements and application procedures, do drop us an email at info@gstudyabroad.com, or fill in the enquiry form below. You can also come to our office and have a consultation with our friendly consultants! We offer scholarships and bursaries! Study Abroad, Think Global!